Sodium chloride (NaCl) is commonly known as salt. It occurs in the crystal form. It is used in large quantities across various industrial and consumer applications. Sodium chloride is obtained by evaporating sea water or brine by solar and vacuum evaporation methods. Additionally, it is produced by mining salt halite, which is known as rock salt. It is globally manufactured in abundant quantities to cater to the demand from various industries such as chemicals, textiles, plastics, personal care, and food & beverages. Growth in the chemical industry has boosted the demand for chlor-alkali products such as chlorine, caustic soda, and soda ash. Commercially, salt is used as a primary source of chlorine and sodium hydroxide production, as it is extensively available and inexpensive. Chlorine is used in various industries, such as textile, plastics, agrochemicals, and chemicals, to manufacture consumer products such as papers, paints & coatings, pharmaceuticals, PVC, plastic & rubber products, insecticides, and soaps & detergents. Emerging economies in Asia Pacific such as China and India are major producers and consumers of chlor-alkali products. Growth in the chemical industry due to the rise in demand for chemicals in end-user industries is boosting the consumption of chlor-alkali. This, in turn, is fueling the demand for sodium chloride. Salt is used as flavoring agent and preservative food and beverages. The food & beverage industry accounts for large share of the sodium chloride industry. It is the third largest end-use application segment. Salt is extensively employed as a preservative in pickles and processed meats. Ions present in salt prevent the growth of fungi, thus preserving pickles and processed meat for a longer period of time. However, fluctuation in snowfall adversely affects the demand for sodium chloride in de-icing application. Based on grade, the global sodium chloride market has been segmented into rock salt, solar salt, and others (brine & vacuum). Others is a widely used grade of sodium chloride. Vacuum salt is obtained from the brine of the sea water. It is widely used in various applications due to the easy availability and low-cost attributes. In terms of application, the global sodium chloride market has been segmented into chemical intermediates, de-icing, flavoring agents & food preservatives, water treatment, agriculture, and others. The chemical intermediates segment accounted for key share of the market in 2017. It is estimated to be a rapidly growing segment during the forecast period owing to the wide consumption of salt as raw material and chemical reagent. In terms of region, the global sodium chloride market has been classified into North America, Europe, Asia Pacific, Middle East & Africa, and Latin America. In terms of revenue, Asia Pacific dominated the global sodium chloride market in 2017. Asia Pacific is estimated to lead the global sodium chloride market in the next few years. The market in the region is projected to expand rapidly during the forecast period. North America and Europe are mature regions of the global sodium chloride market. The market is anticipated to expand at a rapid pace in these regions due to the presence of key manufacturers. The market in Middle East & Africa and Latin America is expected to expand during the forecast period due to the presence of emerging economies and growth of chemical and food & beverages industries. High degree of competition exists among players operating in the global sodium chloride market. The market is dominated by large players that are technologically sound. These account for prominent share of the market. The sodium chloride market is capital and technology intensive. Sodium chloride is also used in high-end applications; therefore, brand image plays a vital role in the market. Key players operating in the global sodium chloride market include Akzo Nobel N.V., Cargill, Incorporated, Compass Minerals International, Inc., and K+S AKTIENGESELLSCHAFT. Based on grade, the global sodium chloride market has been segmented into rock salt, solar salt, and others (brine & vacuum). Others is a widely used grade of sodium chloride. Vacuum salt is obtained from the brine of the sea water. It is widely used in various applications due to the easy availability and low cost attributes. In terms of application, the global sodium chloride market has been divided into chemical intermediates, de-icing, flavoring agents & food preservatives, water treatment, agriculture, and others. The chemical intermediates segment accounted for key share of the market in 2017. It is estimated to be a rapidly growing segment during the forecast period owing to wide consumption of salt as raw material and chemical reagent. Based on region, the global sodium chloride market has been segregated into North America, Europe, Asia Pacific, Middle East & Africa, and Latin America. Asia Pacific is estimated to lead the global sodium chloride market in the next few years. The market in the region is projected to expand rapidly during the forecast period. The report analyzes and forecasts the sodium chloride market at the global and regional levels. The market has been projected in terms of revenue (US$ Mn), and volume (kilo tons) from 2018 to 2026. The study includes drivers and restraints of the global sodium chloride market. It also covers the expected impact of these drivers and restraints on demand for sodium chloride during the forecast period. The report also highlights growth opportunities for the sodium chloride market at the global and regional levels. The report comprises a detailed value chain analysis, which provides a comprehensive view of the global sodium chloride market. Porter’s Five Forces model for the sodium chloride market has also been included to help understand the competition landscape. The study encompasses market attractiveness analysis, wherein grade and application segments have been benchmarked based on their market size, growth rate, and general attractiveness. 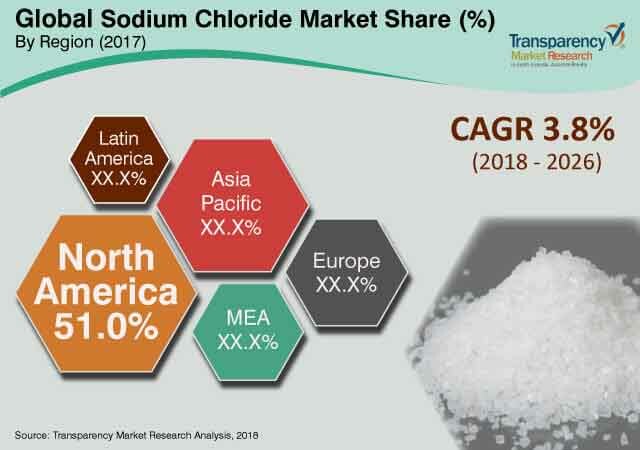 The study provides a decisive view of the global sodium chloride market by segmenting it in terms of grade, application, and region. These segments have been analyzed based on present and future trends. Regional segmentation includes current and future demand for sodium chloride in North America, Europe, Asia Pacific, Latin America, and Middle East & Africa. The study includes profiles of major companies operating in the global sodium chloride market. Key players profiled in the report are Akzo Nobel N.V., Cargill, Incorporated, Compass Minerals International, Inc., K+S AKTIENGESELLSCHAFT, Tata Chemicals Limited, Wacker Chemie AG, Südwestdeutsche Salzwerke AG, The Henrique Lage Salineira do Nordeste, INEOS Salts, Maldon Crystal Salt Co., Dampier Salt Limited, Swiss Salt Works AG, Cheetham Salt, and Dominion Salt. Market players have been profiled in terms of company overview, business strategies, and recent developments. The report provides the estimated size of the global sodium chloride market for 2018 and forecast for the next eight years. The size of the global sodium chloride market has been provided in terms of revenue. Market numbers have been estimated based on grade, application, and region. The market size and forecast for each grade and application segment have been provided at the global and regional levels.